Enjoy a safe and luxurious bathing experience with our walk-in tubs. Our luxurious walk-in tubs are designed with your comfort in mind. We believe that bathing should be a simple and enjoyable experience for everyone. Every walk-in bathtub is manufactured in the U.S. and is designed to be easily accessible and comfortable. 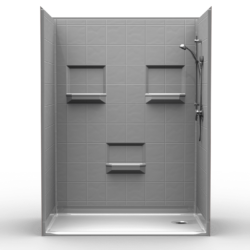 Our walk-in tubs come in a variety of different sizes to fit in your existing bathing spaces and are easy to maintain and clean. Some varieties even come with optional features such as heated back rests with timed controls, water and air jets, as well as, a flip-up seat for additional entry space. Our walk-in tubs are designed for safe and accessible bathing with twice the depth of a normal tub. 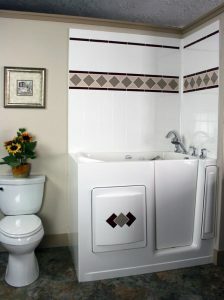 Walk-in tubs feature comfortable contoured seating, grab bars and a non-skid floor. An optional tub wall surround is also available for a seamless fit into your existing bathroom. Whether you are looking for a walk-in bathtub to fit perfectly in your existing space, or you have the ability to expand, Orca HealthCare has the right fit for you and your home. The Escape Plus offers a wider door for easier entry and added safety. The Escape walk-in tub is our standard model and is designed to fit in the space of your existing tub. 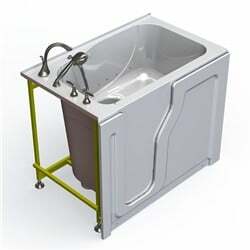 This model holds the least amount of water while still allowing for a full body soak because of its extra deep tub. The Escape has a 60 US/50 CAD gallon capacity. The Liberty walk-in tub has a 26” external dimension and is perfect for homes with narrow doorways. Because of its superior engineering, the interior bowl dimension is the largest among all walk-in tubs of its size. This tub has a 75 US/62 CAD gallon capacity. 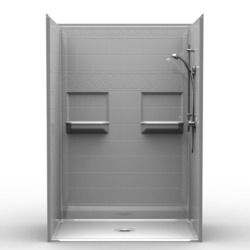 The Escape Plus walk-in bathtub offers a wider door for easier entry and added safety. The Escape Plus also features a 2” drain allowing for the fastest draining time in the industry! This model has a 93 US/77 CAD gallon capacity. 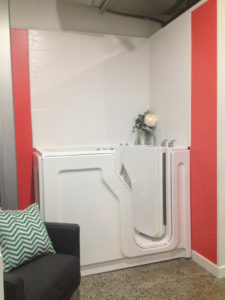 Our largest model is The Big E walk-in bathtub. 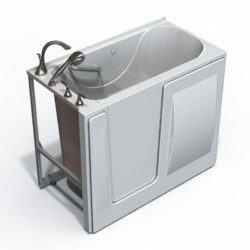 The Big E is the largest walk-in tub of its kind and features a flip-up seat and two drains for a quicker draining time. This model has a fill volume of 120 US/99 CAD gallons with bather. 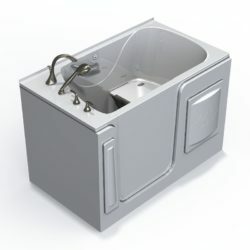 All of our walk-in tub models feature a comfortable contoured seat, grab bar and non-skid floor and has a unique uni-body construction – one seamless composite fiberglass bowl with a luxurious gelcoat surface. In addition, therapeutic air and water jets are also available. Orca walk-in tubs fit into your existing bathing space and look stylish. All walk-in bathtubs are designed to seamlessly fit into your existing bathroom so you do not have to redesign the entire space just to accommodate your new walk-in tub. 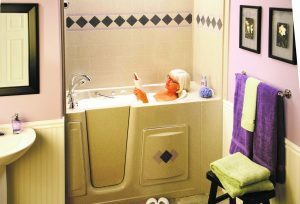 Being able to easily access your bath allows you to enjoy the freedom and independence you are accustomed to. A walk-in bathtub allows you to maintain your normal routines without assistance while also enjoying the luxury of heated seats and therapeutic water jets. Our premier walk-in tubs allow for an exceptional bathing experience with advantages that far outweigh traditional bathing methods. While installing a walk-in bathtub is a necessity for some, it does not mean that you have to forgo luxury and style for accessibility. Old technology meant that you were left cold and uncomfortable while waiting for your walk-in bath to fill up. Newer models, however, come with a heated liner that is in the back of the seat allowing you to be cozy and comfortable right from the start. It is also great to know that the tubs empty faster as well – depending on the size you choose it will only take between three to eight minutes! You deserve to have a safe and stress free bathing experience and Orca HealthCare offers the walk-in bathing solutions to make it a reality.